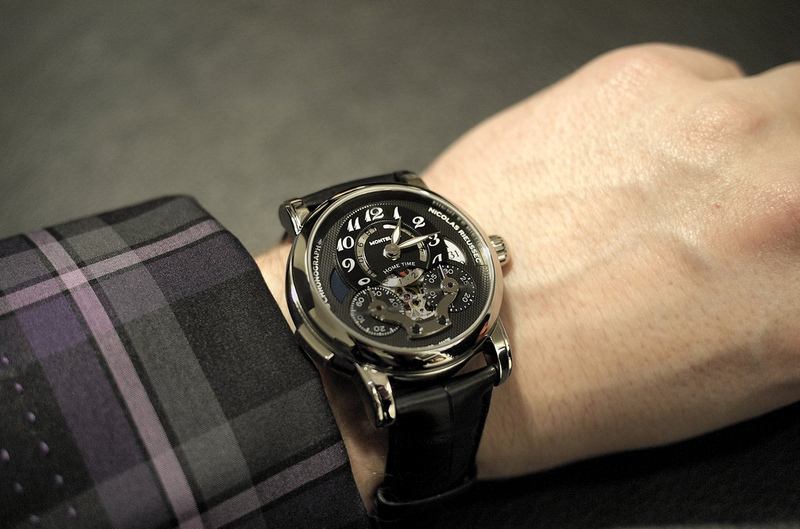 At the SIHH show last month, Montblanc introduced the Nicolas Rieussec Chronograph Open Hometime. A new addition to the Nicolas Rieussec collection that features an in-house column-wheel chronograph, like the model originally introduced in 2008, now with a GMT function. 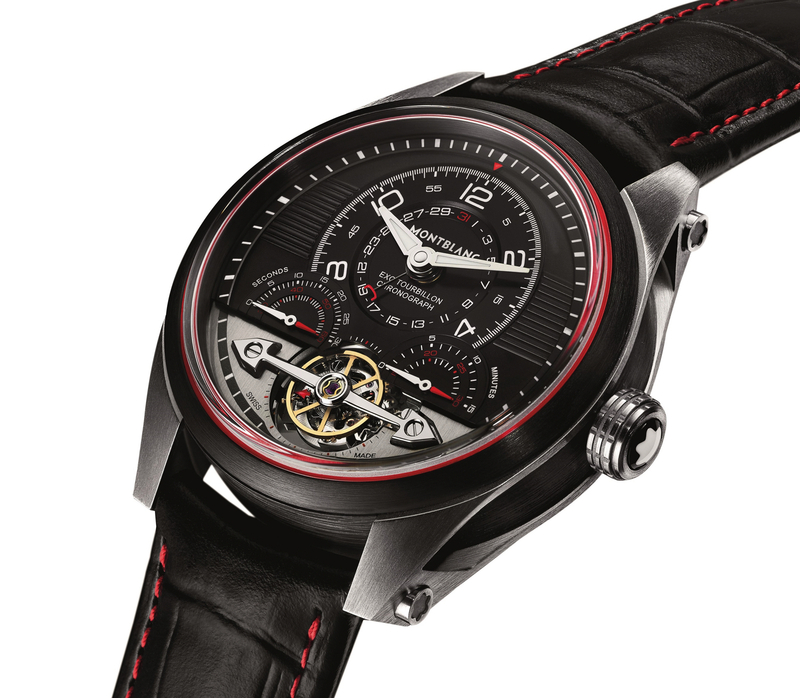 The Nicolas Rieussec Chronograph collection pays homage to Nicolas Mathieu Rieussec, who invented the first chronograph. Rieussec’s original 1821 chronograph invention was housed in a large wooden box, and it required ink to record elapsed times on an enameled disk which then needed to be cleaned in-between each measurement. The time writer was hardly practical, but it eventually led to the wristwatch chronographs we know today. The Nicolas Rieussec Chronograph GMT comes in a 43 x 15 mm polished stainless steel or 18k red gold case. It has a domed sapphire crystal, with a double anti-reflective coating on the front; and a screwed sapphire case back. The crown is in stainless steel or 18k red gold, with the signature inlaid mother-of-pearl Montblanc emblem. 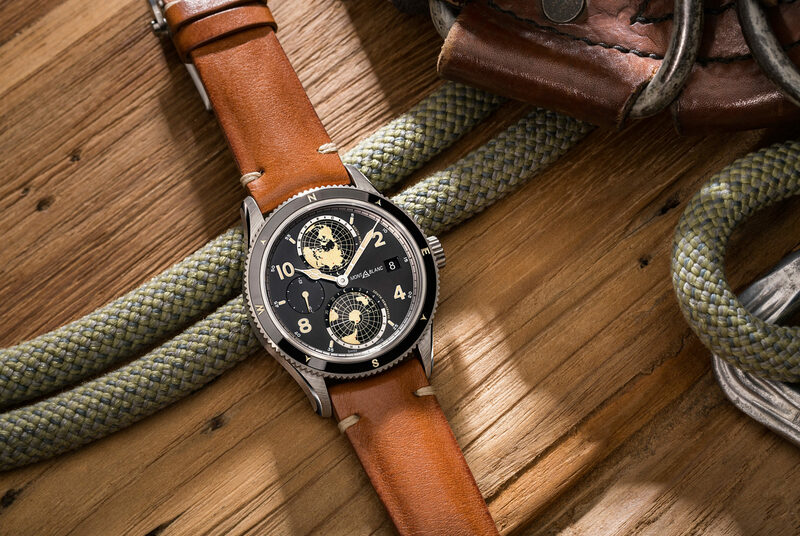 The dial is anthracite-colored with white Arabic numerals and “grain d’orge” guilloché pattern; luminescent feuille hour and minute hands. Functions include hours, minutes on off-center dial, second time zone at 9 o’clock and a date display at 3 o’clock. A specially designed travel function allows quick forward and backward resetting of the hour hand and date display. Powering the Open Hometime is a modified version of in-house caliber MB R200, the new designation MB R210 represents the new GMT function. The self-winding movement has 40 jewels, 295 parts, a frequency of 28,800 vph (4Hz) and 72-hour power reserve (thanks to twin power barrels). 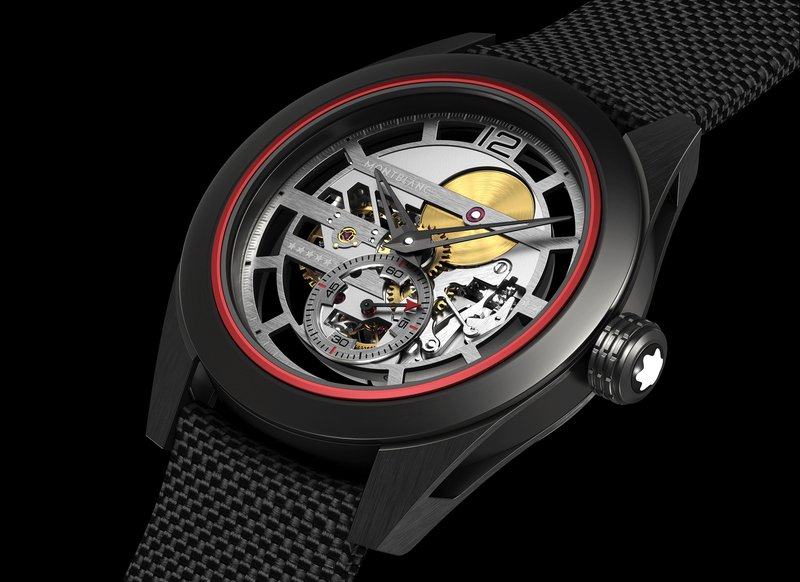 The mainplate is finished with rhodium-plated circular graining; the bridges rhodium-plated bridges with Geneva stripes. The gear train has a special toothing for more efficient power transmission. Elapsed times of 60 seconds and 30 minutes are indicated by motionless hands pointing to the corresponding times on the rotating discs at at 5 and 7 o’clock – a throwback to Rieussec’s original chronograph. All chronograph operations: start, stop and reset are controlled via one pusher ( a monopusher) at 8 o’clock on the case flank. Black alligator strap with double-folding clasp in steel or 18k red gold. Water-resistance is 30 meters. Next articleGirard-PerregauxGirard-Perregaux Three Bridges "Blue Spinel"